A 1958 Gibson Flying V that once belonged to The Kinks' Dave Davies is heading to the auction block. Davies, who would famously often play the V between its wings, bought the korina-bodied Gibson on tour in June 1965. 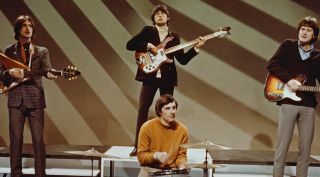 He used it on Kinks classics such as "'Till the End of the Day," and on the band's appearance on the TV show, Shindig. Davies owned the guitar until 1992. According to its Heritage Auctions listing, the guitar has been refinished, with a heel crack and a broken Gibson logo having also been repaired. Every other component of the guitar though, is completely original. To see the full listing, head on over to entertainment.ha.com.